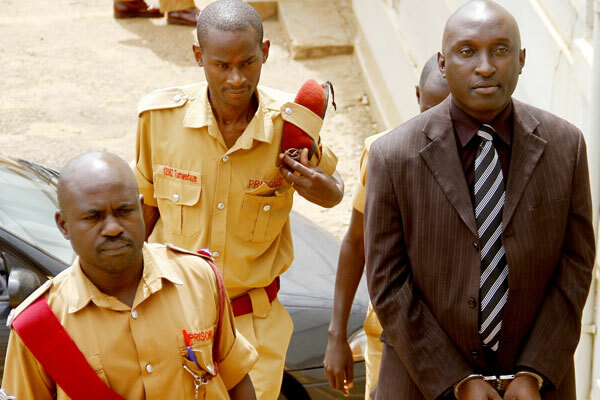 KAMPALA- After a three months search without any yielding results for the previous court assessors in the case of a suspected serial killer Baker Walusimbi, High Court judge has decided to hear the case afresh. Justice Yasin Nyanzi’s decision was prompted by the office of Director of Public Prosecutions (DPP) who told court that they had failed to trace the missing two court assessors Janet Nandudu and John Bosco Higenyi, who had sat in the first trial that had reached at the judgment level about 10 years ago. The assessors were necessary in law to give their layman’s opinion on the murder case before the court announced its final judgment. “For purposes of a fair trial, I will have to first consider whether or not to release Walunsimbi on bail before proceeding with the trial in which the suspect is expected to enter a fresh plea,” Justice Nyanzi said before adjourning the case to August 29. Walusimbi who has been on remand since 2006 is accused of murdering female students by slitting their throats and robbing them of their valuables in 2005. He faces four counts of robbery and three counts of murder of Moreno Nebulae (a Senior Six student of Makerere College School and Jacqueline Najjombwe and Maria Katasi (both university students and residents of Najjanankumbi on Entebbe Road). Section 69 (2) of the trial on Indictment Act demands that if court assessors in a case cannot be traced, the trial has to start afresh. A retrial means that Walusimbi will plead to the charges afresh. The court proceedings in the previous trial will be totally disregarded and fresh evidence presented and evaluated in the new trial.